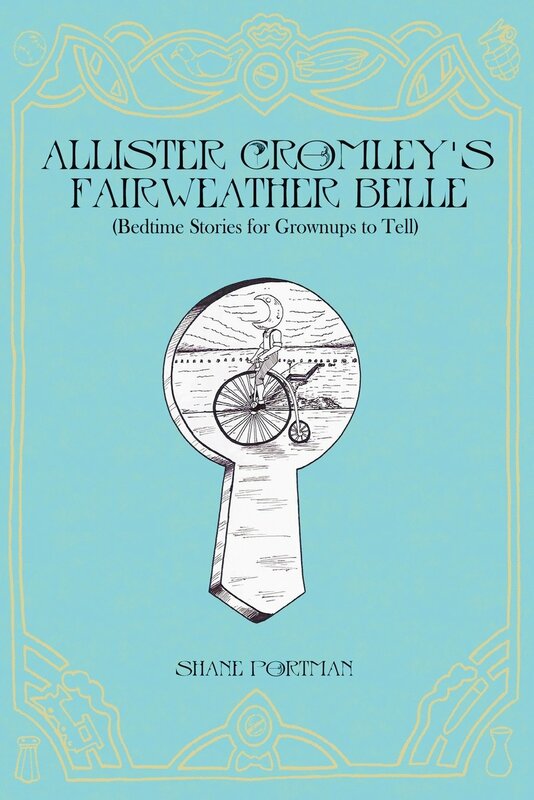 “Allister Cromley’s Fairweather Belle is an illustrated collection of bedtime stories that were written to give grownups something to read aloud to other grownups or quiet to one’s own grownup self to invoke those childhood feelings of safety, wonder and even excitement in the face of all the questions that lay in the dark. Each sepia-tinted story follows Allister, a mustachioed adventurer/wanderer/philosopher, on his journey through the early 20th century. He enlists in World War I, witnesses the awe and terror of the first escalator, becomes the most subtle of anarchists, dances with a bronze statue of Joan of Arc and even meets Winston Churchill (but not the Winston Churchill you may be thinking of-if, indeed, you think of Winston Churchill). I found the concept of this collection intriguing and I’m glad I sat down to read it. We’ve all read stories as children and even more often have had stories read to us when we were young. What these stories about Allister Cromley effectively do is to bring an adult reader back into a world where imagination is more important than sticking with straight facts or reality. I like to consider these stories to be just what the author describes them as. They are bed time stories for adults. While Allister’s stories are only a few pages each, as a whole, the reader is introduced over the course of the collection to a peculiar and likable new friend. I enjoyed the insight the narrator gave the reader about how Allister lived in the world and how he saw things. At times we have to just let go of how we see reality and let our imagination roam freely. Allister is a reminder of just that. The narrative style also worked well for this collection. It’s written just like someone telling the reader a story before bed. It also doubles as an easy way to recite the stories to an audience of adults going to sleep. That’s an interesting picture isn’t it? A group of 30 somethings in sleeping bags in a living room, all listening to another 30 something tell them stories like the ones from this book. Maybe it’ll inspire more story time in adults. Who knows. I feel I should close out this review by mentioning the illustrations. Without the variety of great illustrations to go along with the stories, I don’t feel that the “bedtime story” feel would have been as strong when reading through. There are a few illustrators for this book and that also helps enhance the uniqueness that Allister and each story holds. Shane Portman is a Los Angeles-based writer/performer with a degree in theatre and experience in Chicago’s sketch and improv comedy community. He started writing Allister Cromley’s Fairweather Belle as a blog in 2002 and, in 2008, began crafting the stories into live storytelling experiences with directors, actors and musicians in New York City. In 2012, the first set of 12 stories were published in a book that featured illustrations by 12 independent artists. And an additional 14 stories were spun into a podcast where each story was musically scored by a different guest musician. This entry was posted in Review and tagged Adult, Allister Cromley, Bedtime stories, children's, Collection, Fairweather Belle, grown ups, joan of arc, Review, Shane Portman, Short Stories, Short Story, ty cobb, winston churchill. Bookmark the permalink.